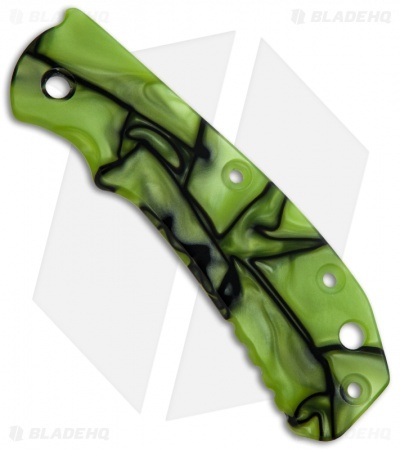 This toxic green and black Kirinite replacement scale for the ZT 0550/0551 knife gives your knife a custom, unique look. Features a smooth finish with chamfered edge. Handmade by BellaBlades. Please note: Each scale will vary from the one pictured due to the unique nature of the material. I just received this custom scale yesterday and in a few short minutes it was on my ZT 0550BW. I was not sure how the toxic green would look, but with the black in the scale on the black knife it looks fantastic. It's a lot of money, but well worth it. The craftsmanship and fit was perfect. Great job!